Each year we enjoy ranking the top Android devices. There’s nothing scientific about it, it’s just us providing our opinion, and each person has their own thoughts as to what device is best. This is the beauty of Android. Anyway, 2013 was an awesome year, one that I’d like to highlight with this week’s #TBT. You see, Motorola was back and in a big way. With MotoMaker, Motorola was allowing folks to customize their own smartphone, complete with wood finishes, accent colors, and even boot animation text. This was unheard of and I’m almost certain it was universally praised by all. Not only was the hardware cool, but a complete abandonment of Moto’s UI skin made the Moto X really stand above the competition. Instead of an ugly re-skin, Moto built in useful features such as Active Display. To us, it was a game changer, a feature that we still use to this day on other devices (Always-On). There were plenty of other devices we enjoyed, too, of course. There was the HTC One, a huge advance in terms of HTC’s design language, the Nexus 5 from Google that featured LTE again after being absent in the Nexus 4, and one of the last Google Play Edition devices we used heavily, the Galaxy S4 variant. As you’d expect, folks had plenty to argue down in the comments, with many claiming the Galaxy Note 3 should have taken the top prize, let alone be left out of our Top 5 entirely. Yeah, well, that’s just, like, your opinion, man. 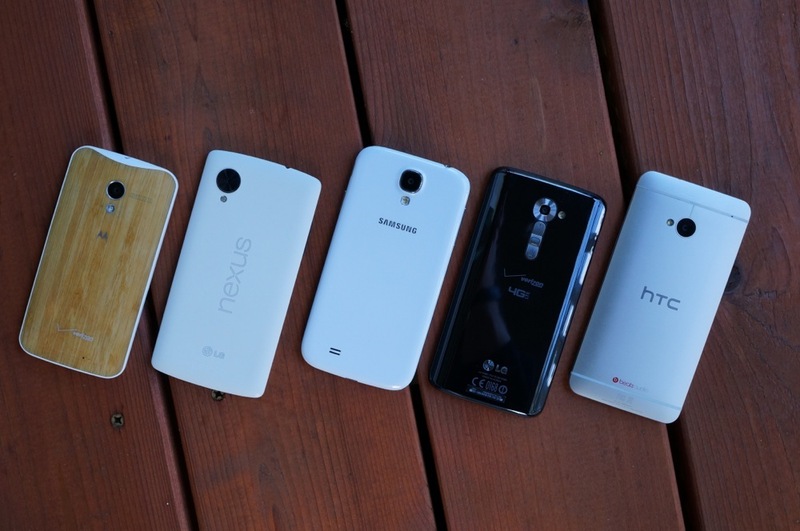 Here’s the Top 5 Android phones of 2013, declared by us. Honorable mentions were given to the following devices. Needless to say, 2013 was a solid year for Android. If you ask us, 2017 is also looking very good so far.